Too often breakfast cereals and store bought granolas are loaded with hidden sugars. This is no way to start the day. 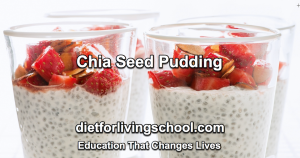 For 10 years now we have served chia seed pudding to hundreds of students at Diet For Living School for breakfast. Everyone loves it. It’s delicious and nutritious. Best of all, it’s proof that getting and staying clean and healthy doesn’t need to involve pain or deprivation. Chia seeds are a mini food powerhouse. They are filled with alkaline plant based protein, are high in fiber and have more calcium than cow’s milk. They contain more antioxidants than berries and more of the good Omega-3 oil than salmon. The secret to making the perfect Chia Seed pudding is to let it set overnight. Here is our very easy recipe so you can get started eating it at home. 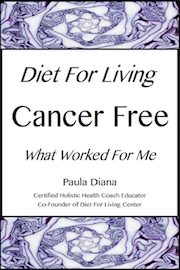 from my e-book: “Diet For Living Cancer Free/what worked for me”. Simply mix all the above ingredients together and store in a glass jar in the refrigerator until it thickens. Great with fresh or frozen berries on top. Or maybe chopped almonds or banana. The sky’s the limit for toppings!!!! > Prepare for what no longer serves you to drop away. > Prepare for more awareness. > Prepare to inspire others. > Prepare for your dreams to come true. > Prepare for a new life and a new power to come through you. > Prepare for 2018 to be your Best Year Yet! Our mission: To get as many people as possible excited about holistic healing. To help encourage you to take this step forward, we have our spectacular ‘Fall Give Away’ starting October 28! Save on your education and get plenty of free gifts to help you get started. > $500 off the total price of your tuition!!!! Wow, right? We want to give you all the incentive you need to get healthy, help your family become healthier and bring that knowledge to your community to build a successful career. > Free! 45 minute one-on-one Clarity Coaching Session (worth $125) to help guarantee your success when you register. > Free! A copy of my e-book Diet For Living Cancer Free/What Worked For Me sent to your in-box right away when you register!! > Free! A copy of Living Cuisine/The Art and Spirit of Raw Foods when you attend class (a $25 value!). > Free! ‘Our 3 Favorite Vegan Cheese Recipes’ when you subscribe to our Newsletter. Join our tribe of 3,000 readers dedicated to learning how to live a better way today. All this for you when you sign up for our New Year’s Early Bird Sign-up Sale beginning October 28. Or call now and get in early for the sale price. Space is limited. Please Share This Post With Anyone Looking For A Career That Makes Sense!